24 October 2017, Addis Ababa: Today, as the world commemorates World Polio Day, we, the World Health Organization (WHO), UNICEF and Rotary International, reaffirm our commitment to building on the success of our joint polio eradication efforts and sustaining the polio free status of the country. Today, we are looking back at nearly three decades of concerted global polio eradication efforts. The Global Polio Eradication Initiative was created in 1988 after the World Health Assembly resolved to eradicate poliomyelitis globally and has since made remarkable progress towards reaching the eradication target. As a result, polio cases globally decreased by over 99 per cent from an estimated 350,000 cases in 1988, to only 37 reported cases in 2016. Furthermore, the number of countries with polio endemic decreased from 125 to only three countries – Afghanistan, Nigeria and Pakistan. However, until the polio virus transmission is interrupted in these polio endemic countries, all countries remain at risk of polio importation. 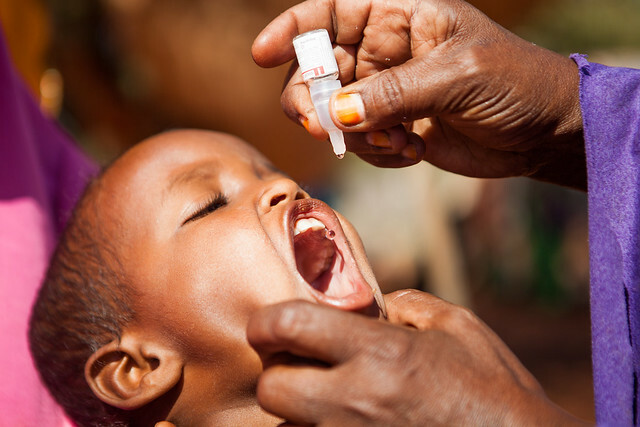 Ethiopia maintained its polio-free status for almost four years (45 months) after the last wild polio case was reported in Somali region in January 2014. We recognize that this achievement is a result of the effective leadership of the Federal Ministry of Health and the great partnership of polio eradication initiative collaborators, donors and partners including: Rotary International; Bill and Melinda Gates Foundation; WHO; UNICEF; USAID; CDC; CORE Group; and many frontline health workers who have played a key role in the successful fight against polio. We are committed to building on the recommendations which Ethiopia received from the Africa Regional Certification Commission (ARCC) in June 2017 when Ethiopia’s submission of a national polio free status report was accepted. As such, we will strive to strengthen and maintain routine immunization and surveillance with a particular focus on pastoralist communities, refugees, hard to reach and border areas as well as strengthening outbreak preparedness and coordination, cross-border surveillance with Somalia and others. 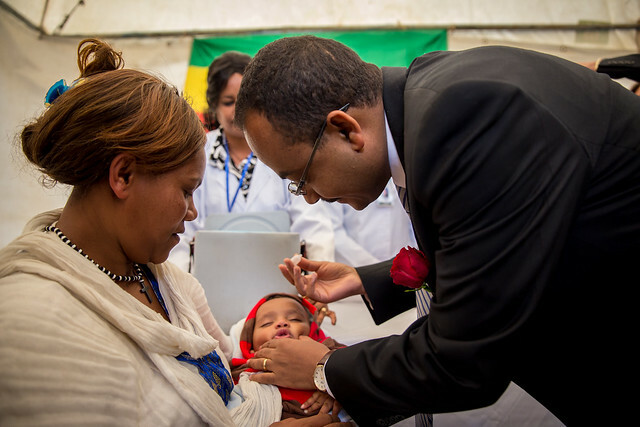 The theme for this year’s World Polio Day in Ethiopia is “Commending Ethiopia polio free status, sustaining the gain.” While we celebrate Ethiopia’s polio eradication success, we remain committed to continuing our joint polio eradication efforts in order to sustain this incredible achievement. In particular, we will build on the lessons learned as we strive to achieve regional certification. The Polio Eradication and End Game Strategic Plan, developed by the Global Polio Eradication Initiative, envisages a polio free world by 2018. While we have come very close to achieving this goal, much remains to be done. We would like to call on all stakeholders to renew their commitment to a world which is free of polio. 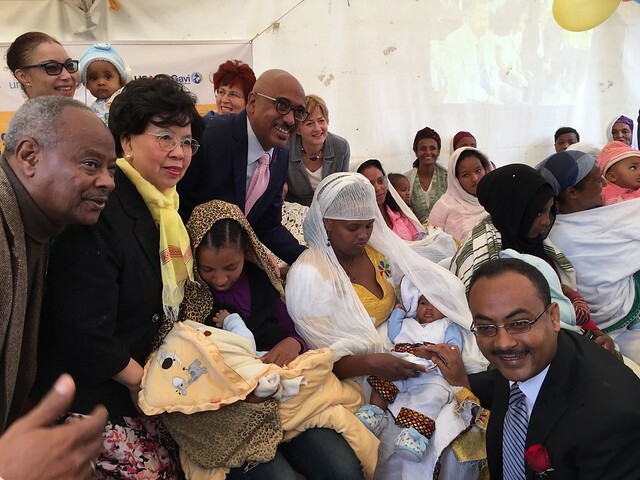 Addis Ababa, 23 October 2015 – Marking the occasion of World Polio Day 2015, the World Health Organization, UNICEF and Rotary International, jointly reaffirm their commitment to ensure Ethiopia joins all countries in a polio-free world by 2018 – the global target for polio eradication world-wide. Ethiopia has been free of the wild-polio virus (WPV) for the last 21 months, since the last confirmed case in Ethiopia’s Somali Region. The 2013-2014 Horn of Africa (HOA) polio outbreak resulted in 223 WPV cases across Somalia, Kenya and Ethiopia combined. Out of this number, 10 WPV type-1 (WPV1) cases were reported in Ethiopia, all in the Somali Region. 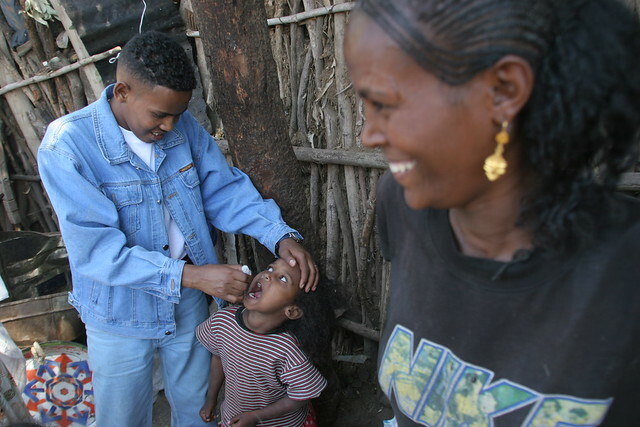 The HOA polio outbreak was a devastating setback for the region, Ethiopia as a country and its people. Due to the aggressive and innovative response led by the Ethiopian Federal Ministry of Health (FMOH) and polio partners, the outbreak was declared successfully interrupted by national and international experts in June 2015. The last reported wild polio virus WPV on the entire continent of Africa was 14 months ago – with the last WPV1 case confirmed in neighboring Somalia in August 2014. While these successes are cause for celebration; we also underline the importance of sustained commitment at every level. In an effort to maintain the momentum, we each play our part as polio partners and bring an important and unique contribution to the polio eradication efforts. “Thirty years ago, we told the world what Rotary believes: that we can achieve the eradication of only the second human disease in history. Our belief is close to becoming reality. For every child, let’s make sure that reality is a bright one. On 23 October, Rotary will host its third annual World Polio Day event,” states K.R. Ravindran Rotary International President in his friendly call to partners and allies to join World polio Day 2015.
WHO and UNICEF continue to prioritise quality polio supplementary immunisation activities (SIA); alongside sustained quality disease surveillance; coordination and technical assistance; social mobilisation; vaccine procurement; cold chain and logistic support. Routine immunisation, the backbone to polio prevention, is the flagship programme for FMOH, WHO, UNICEF and other partners. The National Routine Immunization Improvement Plan 2014-2016, with the objective to achieve national Penta 3 coverage of 95 per cent by 2016, provides focused support to 51 zones, home to the vast majority of unimmunized children of the country. “In the spirit of the polio legacy, we as UNICEF and as a global polio eradication partner, are working together towards a country with a strong routine immunization system, to protect all children, everywhere against polio and vaccine preventable diseases, paving the way for a better future for all,” states Patrizia DiGiovanni, Officer in Charge of UNICEF Ethiopia. As we commemorate World Polio Day 2015 alongside the 70th anniversary of the United Nations, we reflect upon and celebrate the polio eradication initiative contribution to themes of development and human rights; and we envision further contributions to an even brighter future. Closing out 2015 we celebrate together in recognising Ethiopia’s achievements made towards the Millennium Development Goals particularly the reduction of under-five mortality; and we look towards a polio-free world by 2018. Even more ambitiously, we all envision the polio eradication legacy contribution to the 2030 Sustainable Development Goals for equitable health and development for all children and families. The possibilities are endless; the successes are at our fingertips. In partnership, we are almost there. 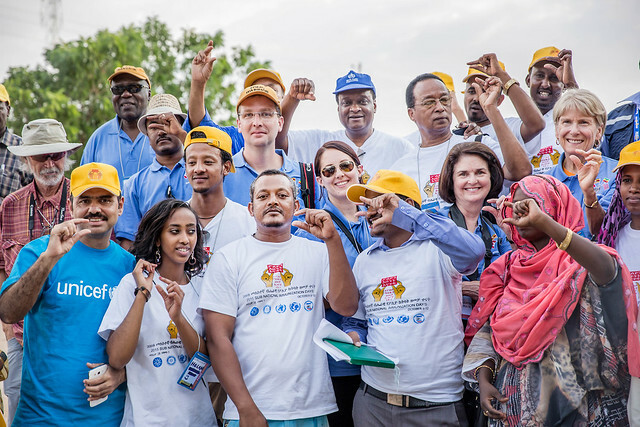 We will continue to work together for a polio-free Ethiopia until the job is done. And then we will keep going. 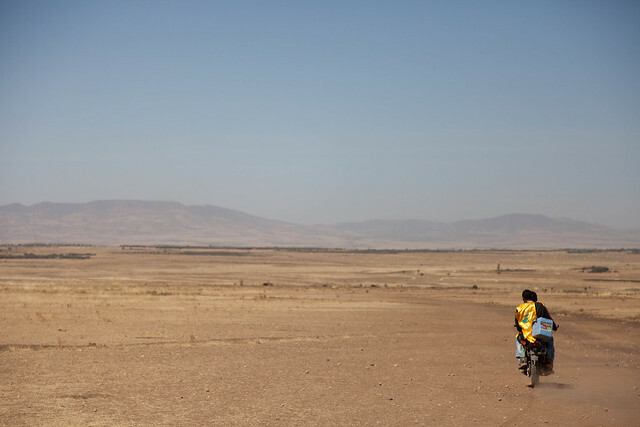 AWBARE, Somali region– Ermias Amare and Salah Kedir, health workers in Ethiopia’s Somali region, zip through the arid plains kicking up a trail of dust as they ride their motorcycle to the next settlement where they will be administering polio vaccines to children under the age of 5 years. It is campaign time in Ethiopia’s Somali region, and the two health workers are on a mission that is critical for the well-being of Ethiopia’s children. Ermias and Salah are taking part in the National Immunisation Days (NIDs) campaign, vaccinating children against polio with the oral polio vaccine (OPV) in the Somali region. Vaccination against polio is essential to prevention of this crippling, disabling and potentially fatal disease which, is easily contracted from person to person, and especially dangerous to individuals and populations when there is not sufficient immunity, or protection, against the virus. 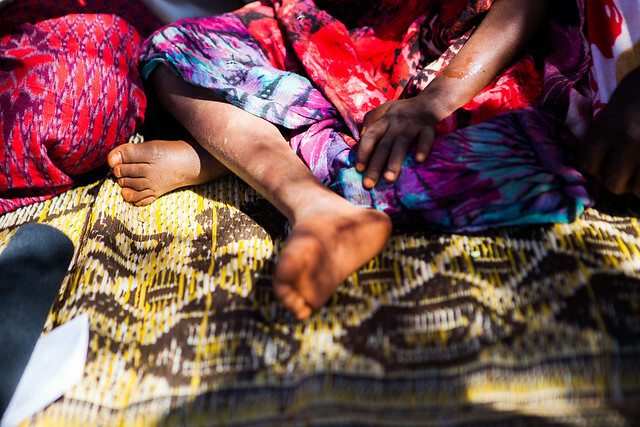 The consequences of polio disease are devastating, for a child, for a family, and for a community. 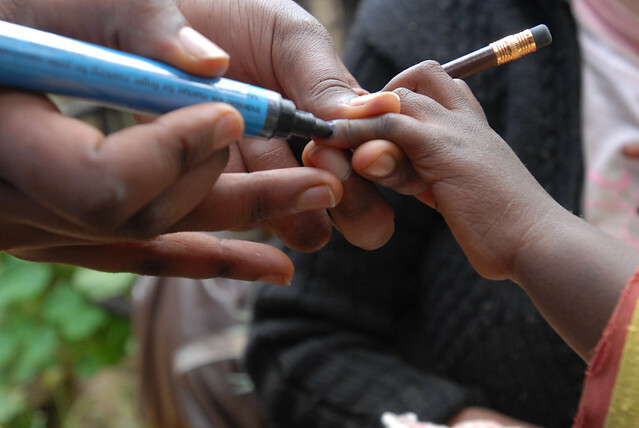 Most of the children in the village visited by Ermias and Salah have their finger marked with ink, indicating that they have already been vaccinated during this present campaign. In August 2013, the Dollo zone of Somali region, in the southeastern corner of Ethiopia bordering Somalia, was hit by a polio outbreak. Tragically 10 children were paralysed as a result of wild poliovirus (WPV) infection. Since the beginning of the polio outbreak, 15 National and Sub-national Immunisation Days (NIDs/SNIDs), have been conducted to date to respond to the outbreak. The total number of WPV cases reported since the start of the outbreak remains at 10 – the last case confirmed 18 months ago. 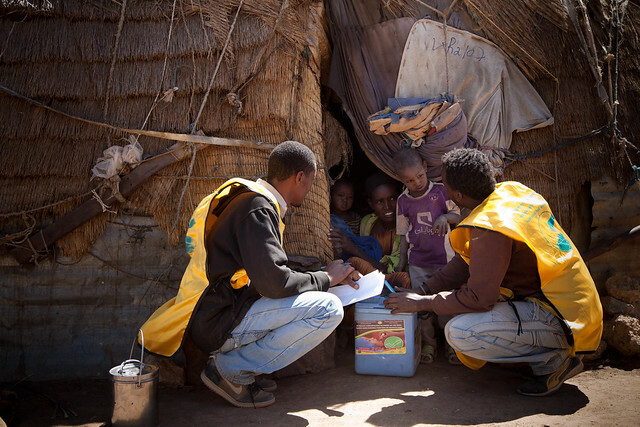 Maintaining the momentum of response efforts has been be critical to ensure no more polio cases are seen in Ethiopia. Communication and social mobilisation efforts have been instrumental in the interruption of the WPV transmission in the Somali region. In Lafaisa kebele (sub-district) of Awbare (woreda) district, a town crier mobilizes the community through a megaphone to alert parents that children under the age of 5 years will be receiving polio vaccinations during the campaign. Nearby, a village Sheikh, trained by the Somali Regional Health Bureau (SRHB) in partnership with UNICEF and the Islamic Affairs Supreme Council, gathers mothers and children for a discussion about the campaign where he explains the benefits of immunisation and urges them to have their children vaccinated. Among the strategies deployed by the SRHB and UNICEF to meet the need for information was to engage religious leaders to council the pastoralist communities, particularly women, about the importance of vaccinating their children, for every round. The eminent position that religious and clan leaders hold in pastoral Somali communities and their ability to mobilize the population, has become a key factor in the success of immunisation activities. 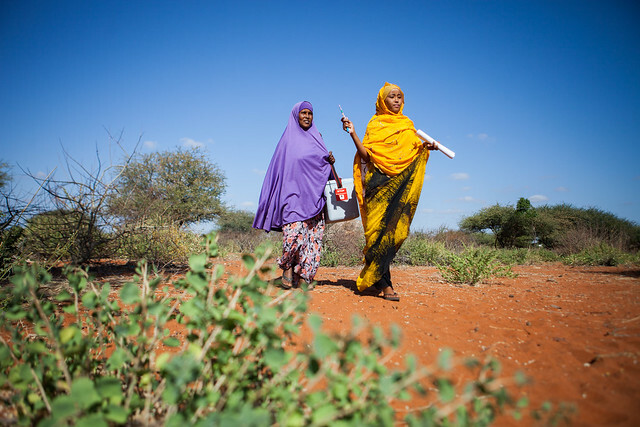 The success of the polio eradication efforts hinges on successful cross-border collaboration between neighbouring countries, such as Somalia and Kenya. Immunisation activities in Ethiopia’s Somali region are therefore held in coordination with health institutions across the borders. Border vaccination points have been set up, and all children under 15 years of age crossing the border receive polio vaccination. “All the children under 15 years of age who cross the border from Ethiopia to Somaliland or the other way are vaccinated,” said Nemo Alele, head of the Awbare Health Center, located near the border with Somaliland. “This is a border area and we explain to the mothers very carefully what harm can happen if there is transmission of the disease. We have good relations with our counterparts in Somaliland and have discussions on a monthly basis. In February, the polio NID aimed to reach nearly 14 million children under the age of 5 years with OPV. According to the national administrative coverage, 99.7 per cent of children were reached with the polio vaccine nation-wide; and over 98 per cent in the Somali region. This is a remarkable achievement, particularly within the context of the highly mobile pastoralist communities of Somali region. Mobile health and nutrition teams (MHNTs) have helped to reach communities with polio and routine vaccination. In the Somali region, 24 MHNTs operate to reach pastoralist and remote populations. The teams work 5-6 days a week in selected operational sites on a fixed schedule, and with the support of local social mobilizers who continuously inform the target community of the arrival of health teams. They reach over 1,000 clients per month, of whom, over 40 per cent are children under the age of 5 years. Reaching all targeted children with the polio vaccine is neither an easy nor simple task. More than 90 million doses of the OPV were provided for all polio outbreak response campaigns to date. Much effort has been exerted by all stake holders to bring the polio vaccine from the manufacturer, to the vaccination teams, to the mouths of children, in a timely, safe and good condition to help protect every child against polio. It is through the leadership of the Federal Ministry of Health and the generous support of polio donors such as the European Union, the Bill and Melinda Gates Foundation and Rotary International, and others that more children have been reached with the polio vaccine, and that interruption of the outbreak has been possible. In partnership, alongside health workers like Ermias and Salah, together, we can ensure polio transmission remains at zero in Ethiopia. Addis Ababa, 12 August 2015 – Support from the European Commission’s European Union has successfully contributed to efforts to contain the spread of the wild polio virus in Ethiopia, the United Nations Children’s Fund (UNICEF) has announced today. A recent Horn of Africa polio outbreak assessment in June 2015 declared that the transmission of wild poliovirus in Ethiopia and Kenya has now been interrupted, with the last case of wild poliovirus in Ethiopia confirmed almost 19 months ago in January 2014. 11 August 2015 also marks the one-year anniversary of the last reported wild poliovirus case in neighbouring Somalia, and on the entire continent of Africa. 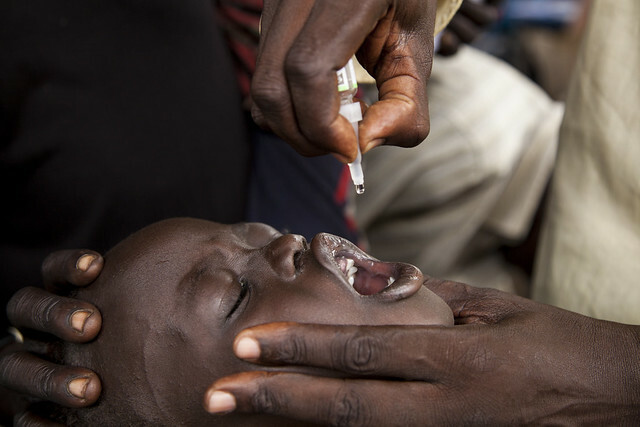 The generous €4 million financial contribution, for polio eradication in Horn of Africa, provided Ethiopia and South Sudan with funds for the procurement of the oral polio vaccine to respond to the Horn of Africa polio outbreak. 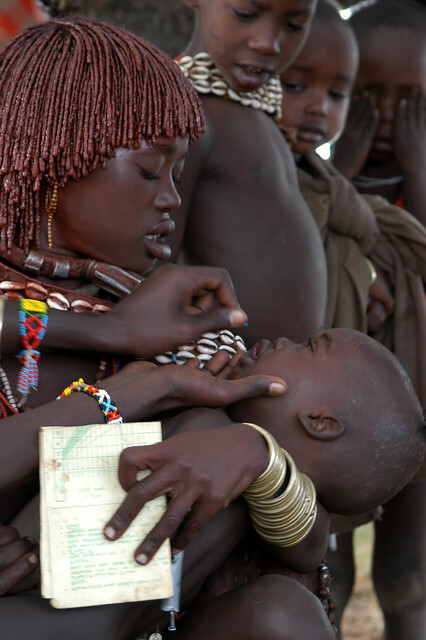 In Ethiopia, a total of 23,783,000 doses of bOPV were procured for four polio supplementary immunisation activities (SIAs), in vulnerable, polio high-risk regions such as Somali, Gambella, Benshangul-Gumuz, Afar, Dire Dawa, Harari; in other high-risk zones in the country and refugee camps. The campaigns also included one nation-wide campaign covering all regions which aimed to vaccinate every single child in the country under the age of five years – over 13 million children. This supplementary immunisation complemented routine immunisation and sought to interrupt circulation of the polio virus by immunising every child under five years of age with two drops of oral polio vaccine for every round, regardless of previous immunisation status. 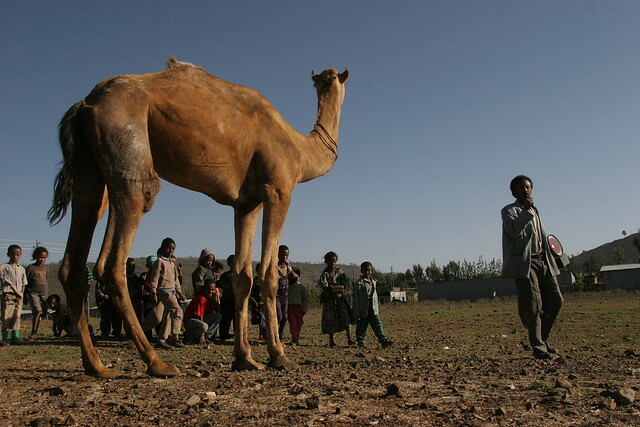 The campaigns, which were carried out in some of Ethiopia’s remotest parts, reaching hard-to-reach mobile and pastoral populations, successfully targeted children who were either not immunised, or only partially protected, and boosted the immunity in those who have been immunised. The EU support contributed to regional efforts to interrupt polio and significantly accelerate the global push to eliminate polio. The polio virus can be swiftly transmitted through water or food contaminated with human waste from an infected person. There is no treatment against polio and vaccination remains the vital key to providing life-long protection for children. The vaccine – which is just two drops in the mouth – is safe, effective and prevents paralysis. Children should be vaccinated several times to ensure they are protected for life. 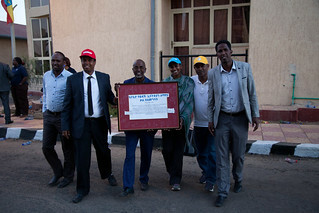 Through the generous support of the EU and other polio donors and partners such as The Centres for Disease Control and Prevention; Crown Prince Court, Abu Dhabi, UAE; the Bill and Melinda Gates Foundation; National Philanthropic Trust; Slim Foundation; Rotary International; Swedish International Development Cooperation and others, successful closure of the outbreak in Ethiopia has been achieved. Continued collaboration is critical to sustain gains for polio, routine immunisation and child and family health in Ethiopia. For many nomads in Ethiopia’s Somali Region, home is a hand-sewn tent. To reach families that are constantly on the move, it is essential to tap into the nomads’ own communication networks. 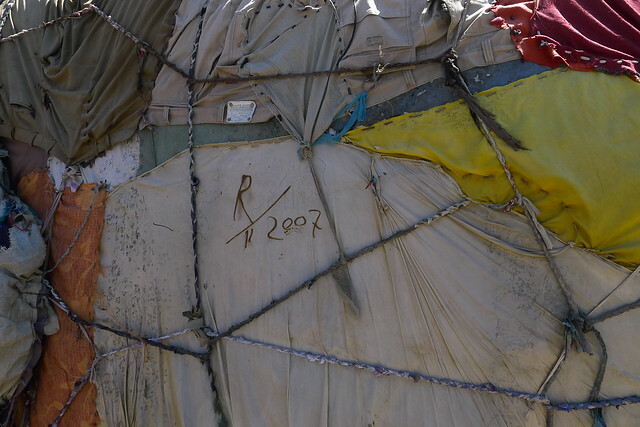 This house-marked tent shows children were reached with the polio vaccine during the campaign. Awbare woreda of the Somali Region, November 2014. 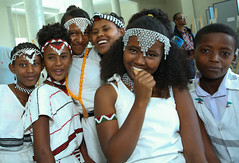 © UNICEF Ethiopia/2014/Rozario. The patches that make up the nomad’s tent say it all. Yellow, orange and red cloth is sewn together with broad stitches — even a pair of trousers is sewn into the mix. Yet the tent is greater than the sum of its parts. It protects a large family from scorching desert sun, from cold nights and rain. 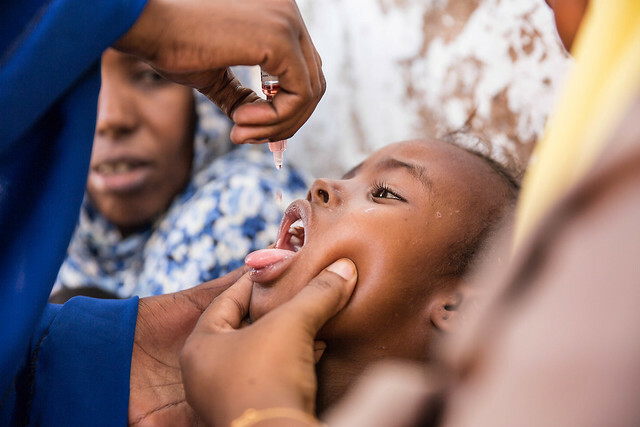 When a polio outbreak struck the Horn of Africa in 2013, WHO and UNICEF with the help of the European Union had to find a way to reach every last child across Somalia, Kenya and Ethiopia. It was a daunting task to deliver multiple doses of OPV (Oral Polio Vaccine) into the mouths of some of the world’s hardest-to-reach children – from war-torn parts of Somalia to the diverse landscapes of Kenya and Ethiopia. 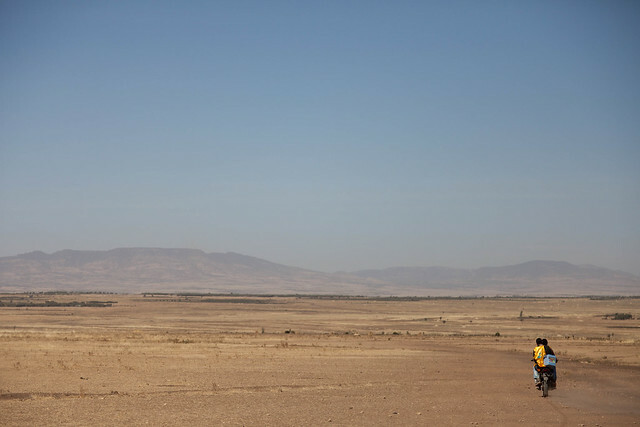 Among the very hardest-to-reach are nomads in Ethiopia’s Somali region, which shares a porous 1,600 kilometer border with Somalia. Here, over 80 per cent of the 5 million people are nomadic, herding cattle, camels and goats across broad stretches of desert in search of water and pasture. For many families, home is a tent sewn together from patches of cloth and carried from one watering hole to another on the back of a camel. To end the outbreak, it was crucial to deliver messages to families constantly on the move. Yet only 11 per cent of people here have access to newspapers or radio. How, then, do you inform families about polio’s risks and the need for children to take OPV? What is the patchwork that makes up this particular community? How do the nomads themselves pass on life-saving information, and receive it? And who is in a position to mobilize families? One answer is with the Sheikhs and Imams. The Somali Regional Health Bureau and UNICEF reached out to the Somali Region’s IASC (Islamic Affairs Supreme Council). This part of Ethiopia is close to 100 per cent Muslim, and the IASC Sheikhs and religious leaders, are amongst the most respected and influential personalities amongst nomadic communities here. The communities have faith and belief in what they say, and seek out their teachings even as they’re on the move. Once the highest-level Sheikhs and Imams became engaged in warning parents about polio’s risks and the need for OPV, Islamic leaders at all levels got on board. Another answer: children themselves. Messages about polio and OPV are also being taught in schools, including the religious schools or madrassas that many children attend. School children – like these, at a religious school near the border with Somalia – can be powerful advocates for polio eradication. Awbare woreda, Somali Region, 2014. 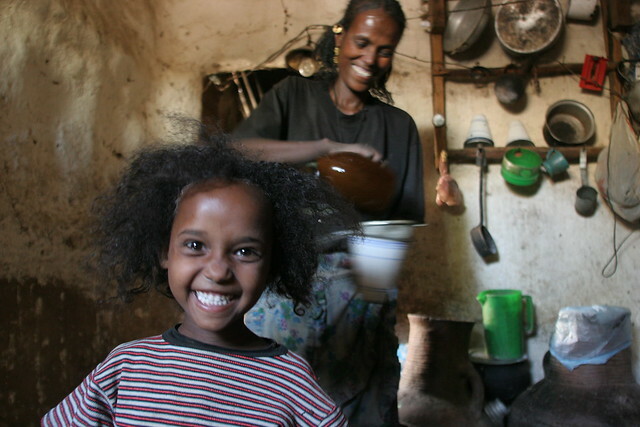 © UNICEF Ethiopia/2015/Mohamed. 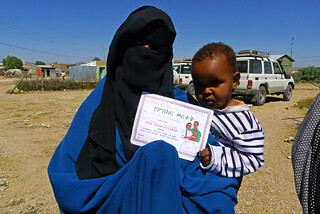 Hibo Abdikarim Ibrahim proudly shows the vaccination certificate for her son, Mohamed-Amin Abdusalam Abdosh, which is a record of his completed routine immunisation schedule. Lafa’isa kebele, Awbare woreda, Somali Region, November, 2014. © UNICEF Ethiopia/2014/Rozario. From Sheikh and Imam to female community mobiliser to clan leader from madrassa student to mother and baby – this is how a movement is built. Each forms a piece of the patchwork to protect children from polio. Just like each dose of polio vaccine, generously funded by the European Union, strengthens the immunity of the community. Yet there is still much to be done. In the last campaign, 5 per cent of children reached were “zero dose” – they had never before received even a single dose of OPV. This is both hopeful, we are reaching children never reached before, and potentially troubling – are there further pockets of zero dose children we have not yet reached, who are entirely unprotected from polio? And while OPV and Routine Immunisation can go a long way toward protecting children from ten life-threatening, vaccine-preventable diseases, ongoing threats to child health and survival in Ethiopia’s Somali region, and across the Horn of Africa, are great. Like the patches that make up the nomad’s tent, no single square of cloth is enough on its own. When we join together, from the Sheikh and Imam to the nomad to the international community, the whole is much greater than its parts. Together we can keep building a tent of protection to end polio and improve child health in the Horn of Africa – and to wipe the virus from the face of the earth for good. This can only be done with generous contributions from donors such as the European Union who have enabled the programme to reach the hardest to reach with life-saving polio vaccine. Addis Ababa | 14 July 2015. Ethiopian Minister of Health Dr Kesetebirhan Admasu, World Health Organisation (WHO) Director General Dr Margaret Chan, The Global Alliance for Vaccines and Immunisation (GAVI) Chief Executive Officer Dr Seth Berkley and UNICEF Deputy Executive Director Ms Yoka Brandt participated in a high level polio vaccination event at Selam Health Centre in Addis Ababa. 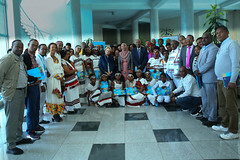 Also present at the event were UNAIDS Executive Director Mr Michel Sidibe, US Ambassador Ms Patricia M. Haslach, Brazil Ambassador Mrs Isabel Cristina, President and CEO of PATH Dr Davis Steve, and Rotary National Polio Plus Committee Chairperson PDG Dr Tadesse Alemu as well as national and international EPI partners, health workers and mothers with their children. “Strong leadership, political will and coordination are key to sustaining the gains made in interrupting polio transmission in Ethiopia and Africa,” said Dr Margaret Chan, commending Ethiopia’s aggressive response to the 2013 outbreak of wild polio virus. “Horn of Africa countries should continue to immunise all at risk age groups until the threat drops to zero and eradication is achieved. And this is possible only through high quality immunisation activities for all communities.” When the wild polio virus outbreak in the Horn of Africa spread to Ethiopia in August 2013, the Government of Ethiopia intensified vigilance, surveillance and mass immunisation campaigns, together with partners like WHO, UNICEF, USAID, the US Centres for Disease Control and Prevention (CDC) and Rotary International. Fifteen supplementary immunisation campaigns were implemented with a focus on high risk areas. Cross-border coordination was heightened, with Horn of Africa countries coming together to implement synchronised response activities. It has been 18 months since the last case of wild polio virus was reported in Ethiopia, and 11 months since the last case in Africa. Dr Kesetebirhan Admasu said, “We will focus on equity and quality for every child and mother in Ethiopia,” adding, “The Government of Ethiopia continues to be committed to eradicating polio from Ethiopia, and Africa.” He further affirmed that “The Government of Ethiopia will continue to engage communities for active participation in routine immunisation, and will continue to build strong health partnerships.” With a view of sustaining the achievements in interruption of wild polio virus transmission, and strengthening the immunisation system, the Ministry of Health of Ethiopia, with support from partners, is currently implementing a two-year Routine Immunisation Improvement Plan 2014-2015. The plan pays special attention to low performing prioritised zones and accelerating efforts to support such vulnerable zones to improve performance, among other priority initiatives. Ms. Yoka Brandt, asserted, “Immunisation, especially routine immunisation, is a core priority within UNICEF, and it will continue to be. With the availability of new innovations, new vaccines, and new research and evidence, we can go fast and far.” Immunisation is among the most cost effective interventions we can provide to our children. Yet, one in five children are not fully immunised worldwide. In Ethiopia and Africa, children in remote and marginalised communities are more likely to be missed. It is these same children that carry the highest risk of diseases that vaccines can prevent. Therefore we must refine our strategies to reach these children and include them in our services. Reaching every community is an approach that strives at inclusion of all communities, especially the marginalised children, ensuring resources and services are available and monitoring is in place. Dr Seth Berkley, highlighting GAVI’s commitment to strengthening routine immunisation, said, “Strong routine immunisation systems are a bedrock of healthy societies and are central to global plans for the eradication of polio. 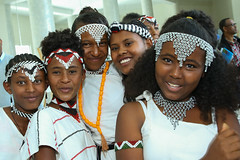 By working together, we are reaching more children than ever before with lifesaving vaccines and the GAVI partners are committed to supporting countries like Ethiopia to sustain and build on their progress on immunisation.” WHO, UNICEF, GAVI and other immunisation partners remain committed to support African governments in reaching every community with vaccination – the gift of life.